What is Suntheanine used for? Suntheanine is a natural remedy for suppressing nervousness and anxiety. It contains an amino acid called L-theanine which is found in green tea plants. L-theanine is known for its relaxing properties. It also improves memory and mood. AOV's Suntheanine capsules are available without a prescription. AOV's Suntheanine is used to alleviate menopausal symptoms. Many women who are going through menopause feel agitated, anxious, depressed or just restless. Concentration problems and memory loss are other common symptoms. Suntheanine helps alleviate these symptoms naturally. This food supplement is therefore particularly suitable for women who want to ease the symptoms of menopause without resorting to synthetic hormones. 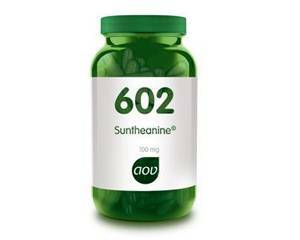 One capsule of Suntheanine contains 100 mg L-theanine. The capsules should be swallowed whole, without chewing, with some water. They should be taken on an empty stomach, which means either one hour before food or two hours after food. AOV's Suntheanine is an all-natural herbal remedy, and therefore also suitable for vegetarians and vegans. one 100-mg capsule, twice daily on an empty stomach. Do not exceed the recommended dose and read the package leaflet carefully before use. AOV's Suntheanine capsules are not suitable for use in children. AOV's Suntheanine is generally well tolerated. In the unlikely event that side effects do occur, please contact your doctor. Consult a doctor on the use of this food supplement if you have health problems such as diabetes, epilepsy, or a cardiovascular, liver or kidney disease. Medicines and food supplements may interact with each other. It is therefore important that you tell the doctor what other medicines or food supplements you are currently taking when you order. Do not use AOV's Suntheanine if you are pregnant or breastfeeding. Instead, talk to your doctor about alternative, safer options to alleviate your symptoms. Suntheanine does not affect your reaction time or impair your ability to drive safely. Suntheanine does not interact with alcohol.